Compact system cameras, mirrorless, E.V.I.L whatever we like to call them, make a lot of sense for a lot of people. There is a review of the Sony NEX-7 at Luminous Landscape - http://www.luminous-landscape.com/reviews/cameras/sony_nex_7_rolling_review.shtml Its a long, detailed and fascinating piece that offers a lot of insight into using the camera. "Panasonic, Olympus, Nikon, Ricoh, Pentax and Samsung have all identified the potential that exists in re-inventing the interchangeable lens camera. Remove the bulky and expensive mirror and prism assembly, develop a new lens mount that allows for smaller and lighter lenses, and innovate in terms of features and interface. That's the formula." "I'll close this out with a personal anecdote. Because of this web site, my workshops, seminars, writing and teaching, I meet and communicate with a lot of pros and advanced amateurs. We chat about photography, the industry, gear, and related topics. A year ago I hardly knew any that owned or even stated an interest in owning a CSC. But this is changing at a very fast clip. A great many are now saying that they've bought a Panasonic, Olympus or Sony Compact System Camera, and with the success and appeal of the Fujifilm X100 are hoping that an interchangeable lens version is under consideration from that company as well. I even know some serious photographers who are selling their DSLRs, and who are looking at advanced CSCs like the Panasonic GH2 and Sony NEX-7. Those that own legacy lenses also find these very appealing, since they can take virtually any lens ever made via adaptors. Are we at the beginning of a new revolution? The entire world of photographic technology has been in a state of revolution for the past decade. The emergence of the CLC is simply another step in this evolutionary process. And with products like the Sony NEX-7, the category isn't going to remain an under-appreciated one for much longer." 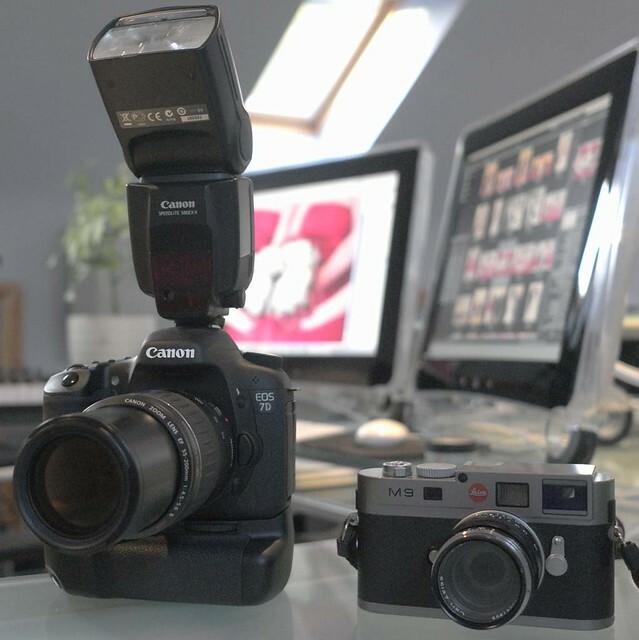 Certainly I see my future camera purchases and what I use as being dominated by this style of camera. While I still have a version of a DSLR, the Sony a77, I can't see it remaining much longer. Particularly if I can get the same MP's in a NEX-7. However as I indicated in my last post I need to be sure that I will get an improvement in image quality over the a77. For many kinds of photography, and indeed for many kinds of professional photography, there is no need for a DSLR. If as I do, you shoot mostly outdoors in good light at low ISO's, there are no benefits from carrying around a large heavy DSLR and equally large and heavy lenses. The fact that many CSC's have weaker anti-aliasing / low pass filters may be a disadvantage for fashion photographers, but for those who shoot the landscape, thats a positive advantage. Do DSLR's have better image quality than CSC's? Well, I think that with the right camera and lens, it could be argued the other way. Can a DSLR match the quality of the best CSC's? 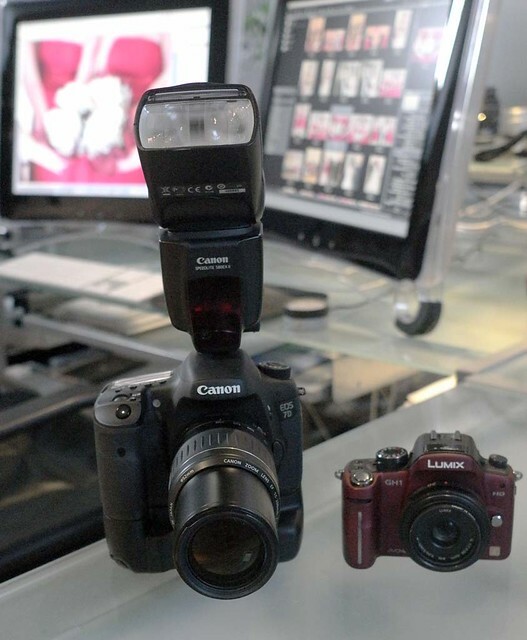 The argument is also about how the DSLR is superior for speed, low light and build quality. But again this argument is looking less and less convincing as time goes on. The Canon 1Ds Mk II cost £6000, body only a few years ago. In terms of AF speed and high ISO performance, how would that compare with a Sony NEX-5n? Plus for that £6000 you could buy 12 5n bodies, which would probably take care of any reliability issues!! There's no denying that big fast DSLR's and huge bulky lenses have their place in many forms of photography, but that is far from the majority. The level of sophistication that the top of the range models have achieved is remarkable, and they will do pretty much anything you want them to. But when you put two images next to each, does a DSLR image obviously exhibit higher quality? No of course it doesn't. The above image demonstrates quite clearly the difference in approach and philosophy. Its not a new thing as the Leica shows, and some of the worlds most respected photographers have taken advantage of that cameras relatively small size and anonymity to produce many of the worlds most revered images. OK so Leicas are expensive. How about this as an alternative? You can hear the sneers right? "Its so small" "And its red!!" But when it comes down to what kind of images each camera produces and what they look like printed A3 on a gallery wall, does "Big camera macho man" still sneer? Most of the "problem" with CSC's and how they are still not regarded as serious tools by many, is one of perception. Just who are they for? What do they say about us as Photographers? If we are serious about photography, then it probably follows that we would like our photography to be taken seriously by others, and yes we probably also want to be seen and percieved as serious also. Since very few of us carry around a portfolio of our work, the chances are that perception will be determined by what camera we choose to carry. OK it shouldn't be important, but how many of us would deny that when we look at other photographers, the desire to check out what gear they are using is almost overwhelming? Be honest now! To my mind, the majority of camera manufacturers have fundementally misunderstood what CSC's are all about. Most still see them as some kind of upgrade alternative to point and shoot and compact cameras. I have excluded Sony from this, who I think DO understand that there is a whole other type of photographer who would be prepared to buy into this system. We want to be "respected" as photographers, right?, part of that is what camera we use, our "badge of acceptance" if you like. We would happily go smaller and lighter, if we could somehow not feel that we looked like a tourist or a snapshooter. A Leica would obviously fit the bill quite nicely. But these are very expensive. So whats the solution. Well, give us something that looks like a Leica, might be a way to go. There are obviously attempts at that direction. Looking at the Fuji X100, the Olympus Pens or the Panasonic GX1, its not hard to see where their "inspiration" comes from. The NEX-7 is a somewhat more conservative design than the previous NEX cameras, and thats not an accident. This desire for "retro chic" obviously hasn't run its course yet, nor do I see it abating anytime soon, and I suspect that we are going to see more of it as time goes on. Leica apparently can't make enough lenses, despite doubling their production. Are all of these being used on M9's? I doubt it. Despite their price, people still want them to put on their CSC's. Voigtlander seriously underestimated the demand for their 25mm f/0.95 m4/3 lens, as did Fuji with the X100. So, it seems obvious to me that many of us who would, under normal circumstances, be natural DSLR buyers and users are being attracted by these smaller, lighter cameras. I say over and over again, that manufacturers ignore the "enthusiast" market at their peril. Because thats where the money is, thats where the interest is, thats where the multi camera owners and frequent camera changers are. I think Michael Reichmann is right, and that the trend towards downsizing (though not in terms of image quality) is unstoppable. Will DSLR's disappear? Well no they won't. Will they become a secondary market to CSC's? Well I used to think they wouldn't. Now I'm not so sure. "On Sony rumors is rumor about future full-frame mirrorless with ability to take Sony E-mount lens (and probably Sony Alpha with adapter). Should be stylized like NEX-7. If they will create that camera and dont make any serious mistake, it will change "the game". At least for me, cause full-frame with ability to take any d/SLR lens, with built in EVF and focus peaking is exactly what I want. Tho I think dSLRs will be with us for long time. Cause shooting sports on mirrorless isnt that easy today. But it will change in future..
For those who like 4/3 or APS-C, time for "change in the game" is right now. :)"
"That wouldn't surprise me at all. Sony seem to be good at this kind of innovation and certainly the a-mount > Nex adapter I'm using is incredibly useful. Since their proposed full-frame sensor is supposedly 36MB I imagine a camera slightly bigger than the NEX-7, which is what the rumour says it would be, is an extraordinary idea. This idea of integrating all their cameras and lenses is also a good one. If anyone can make it work they can. There was an awful lot of skepticism about the 24MP APS-C sensor but its a reality. Its another example of Sony actually reading what people want and attempting to supply it. Full-frame mirrorless has been talked about ever since the G1 appeared, and its a viable idea. It just needed someone to take it seriously. and realise that there is a market for stuff ike this. Too many of the other companies are locked into the idea that photographers are either happy snappers or DSLR toting pros or pro wannabees. Sony seem to be alone in realising that all that talk on the forums and blogs isn't just hot air. People do actually want gear like this and more importantly they are prepared to pay for it. "